Accuse a Christian of being a polytheist by worshiping three gods, and they will vehemently deny it. Yet in their own creeds and hymns, they confess that they worship three persons. 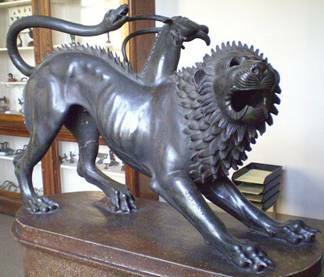 In a feeble attempt to hold onto the Jewish monotheistic roots of their religion, they have conjured up a three-headed beast that they can’t even explain. Its funny how Islamists, who are farther removed from Christianity, can make the objective observation that Christianity is polytheistic. 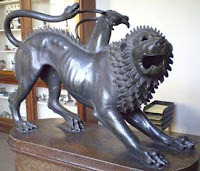 Since the Jewish and Christian religions have historically cobbled their gods together by borrowing bits and pieces from other world religions, I thought it would be interesting to look for hints of the Trinity in mythology. These puzzle pieces could reveal how such a notion came to be. I have read that Christians in the first several centuries would evangelize by comparing elements in Christianity with similar elements in other religions. “Jesus was born of a virgin, conceived by the Holy Spirit, just like Perseus was conceived when Zeus rained down in a shower of gold on his virgin mother, Danae.” And, “Jesus was martyred and rose from the dead, just like Dionysus was eaten by the Titans, then his grandmother Rhea brought him back to life.” So let’s take a look at the Greek and Roman triadic deities, who would have had the most influence on first century Hebrews. 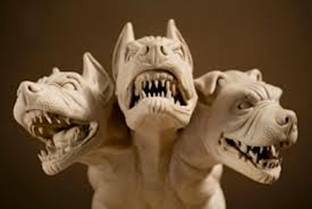 In Greek mythology, Cerberus is a three-headed dog who guards the underworld, preventing the dead from escaping. 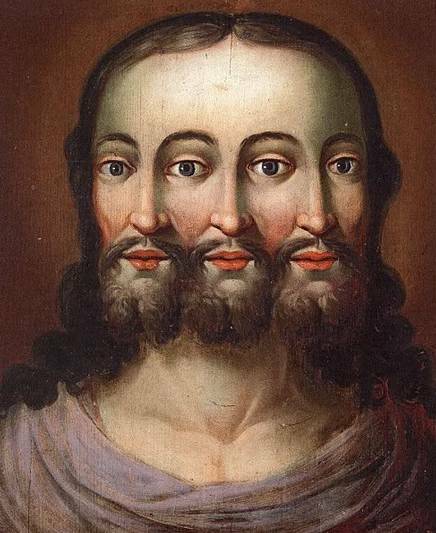 The three heads can respectively see the past, present and future – remind you of anybody? Geryon was a fearsome giant warrior with one body and three heads. 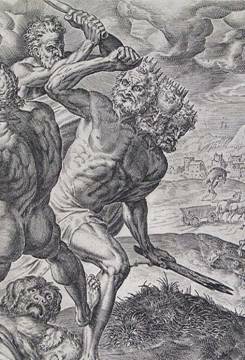 The tenth labor of Hercules was to steal cattle from Geryon, at which time Hercules killed Geryon with a poison arrow. Virgil wrote the Aeneid between 29 and 19 BC. 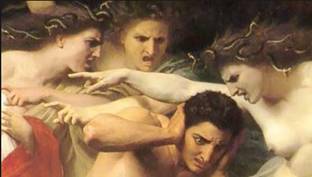 In this epic poem, Erulus, king of Praeneste, was given three souls by his mother, the goddess Feronia. He also had three sets of arms with which to defend himself. Bearing honorable mention would be 1) the Furies, a trio of deities of vengeance, tasked with tormenting those in the underworld who swore a false oath, 2) the Sirens, three femme fatales who lured sailors with their music and voices to shipwreck on the rocky coast of their island, and 3) Cyclopes, which were three brothers who forged Zeus’ thunderbolt and Poseidon’s trident. In the aftermath of the New Testament authors and the revised Nicene Creed of 381, Christians are left to “apologize” for a Trinity doctrine that simply makes no sense. They are relegated to invoke silly analogies, such as how water can exist as a liquid, gas and solid, or how a man can simultaneously be a father, a son, and have a spirit. Or if you drink enough green beer on March 17th, you can use a shamrock.